"A Great Christmas Movie for Everyone"
THE STAR is a wonderful, hilarious, deeply reverential animated family movie centered around the birth of Jesus, but from the perspective of a lowly donkey named Bo. Bo (Steven Yeun) has big dreams of joining the royal parade, which would mean he’d be a part of something important. When his best friend, Dave the dove (Keegan-Michael Key), helps Bo escape from his owner, they set off to pursue greatness. In Nazareth, Mary (Gina Rodriguez) is told by an angel that she will give birth to the Son of God. When she tells her new husband Joseph (Zachery Levi), he is understandably concerned and confused, but after being instructed by an angel, he eventually understands the importance of what God is doing. When Mary finds Bo loose, she grows fond of Bo, and takes him in as her own, even though he wants to be free because of his own mission to find the royal parade. King Herod orders a census with the purpose of finding the prophesied Messiah. So, Mary and Joseph must travel to Bethlehem to comply, and they leave behind Bo. When King Herod’s soldier storms Mary and Joseph’s empty home with his vicious dogs, Bo escapes and sets out to warn Mary of the danger. Along the way to Bethlehem, Bo and Dave make some new friends. However, will they be able to warn Mary of the coming danger? Will Bo get to fulfill his dream of riding with royalty. While Bo and Dave make their heroic journey, the story also follows the journey of the three camels, Felix (Tracy Morgan), Cyrus (Tyler Perry), and Deborah (Oprah Winfrey), who are carrying the three wise men. THE STAR is tremendous fun, with wonderful lessons along the way. A touching story from a unique perspective, THE STAR sets itself apart from many of the other nativity movies. The voice cast is terrific, with Dave the dove voiced by Keegan-Michael Key being particularly hilarious. Other voices with smaller roles include Kelly Clarkson, Patricia Heaton, Kristin Chenoweth, Christopher Plummer, Anthony Anderson, Delilah and Mariah Carey. Obviously, the movie condenses and shifts a few incidents found in the Bible, but never ever sacrifices a very strong biblical Christian theology. That said, the movie deftly balances the goofy fun of the animals with reverence toward God and the birth of Jesus Christ. Jesus is heralded as the Son of God, and the Savior. Also, prayers are answered, and even the animals worship and pray to God. Throughout the movie, beautiful Christmas hymns accompany the story. Mary and Joseph learn that even though God has a plan, that doesn’t always mean it’s going to be easy, and it requires much faith and grace. Overall, THE STAR is almost totally void of objectionable content and is a must-see Christmas movie for every family. Very strong Christian, biblical worldview about the birth of Jesus Christ, with prayer, reverence, and honor attributed to the Biblical account, strong message about trusting God’s sovereignty and loving one’s enemies, although there is one song that includes a line about following your heart. No foul language, but a reference to dung. Very light animated violence with some jeopardy, an evil guard chases animals, guard’s mean dogs attack animals and almost eats one of the characters, a man is hit, and character falls off a cliff. 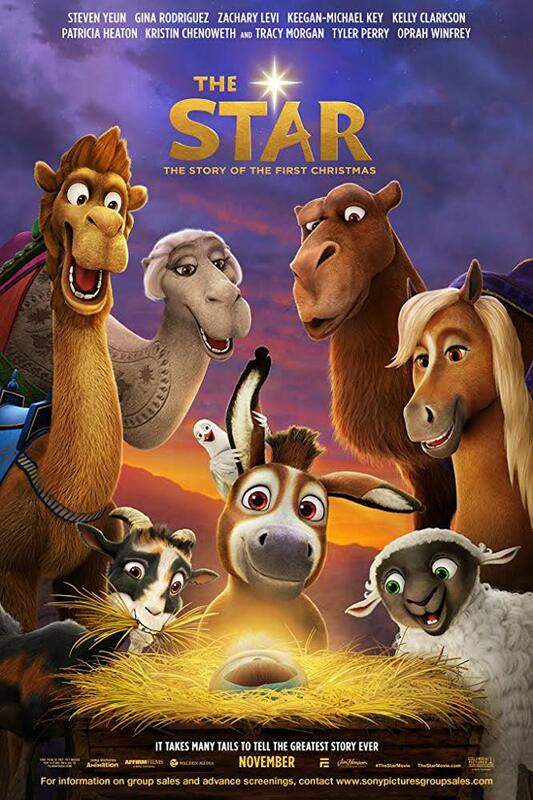 THE STAR is a wonderful, hilarious, deeply reverential animated family movie centered on the birth of Jesus, but from the perspective of a lowly donkey named Bo. Bo and his best friend, Dave the dove, have dreams of joining the royal parade. When Bo escapes his owner’s clutches, he finds himself accompanying a pregnant Mary and her husband Joseph on their way to Bethlehem. Bo may be a part of a bigger adventure than he expected. However, the evil King Herod has his top soldier looking for the pregnant Mary. THE STAR is tremendous fun, with wonderful lessons along the way. A touching story from a unique perspective, THE STAR sets itself apart from many of the other nativity movies. Obviously, the movie condenses and shifts a few incidents found in the Bible, but never sacrifices a very strong biblical Christian theology. However, the movie deftly balances the goofy fun of the animals with a deeply redemptive reverence for God and the birth of Jesus Christ. Overall, THE STAR is almost void of objectionable content. It’s a must-see Christmas movie for everyone.